CUPE 3433 members already give so very much to our community. The 3,433 Acts of Kindness campaign is both a way to celebrate all that we already do, and to encourage us to do the little things that count. 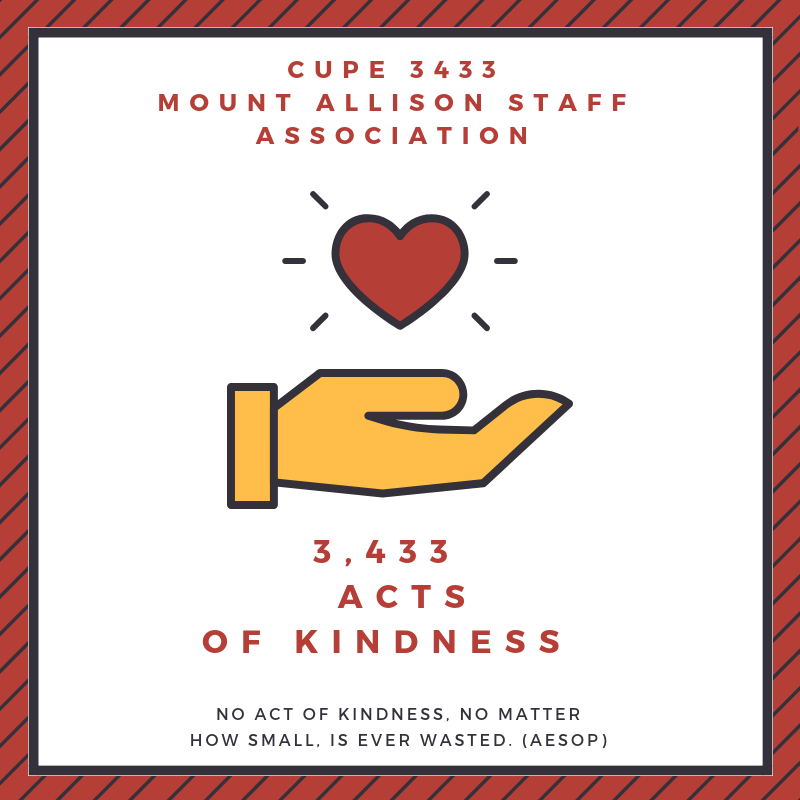 Between September 2018 to September 2019, we’ll be counting up the KINDNESS to hit our goal of 3,433. Because Kindness is Good for us! Kindness decreases pain, stress, anxiety, depression & blood pressure. Volunteer? Let us know! Let someone in line at the grocery store? Let us know! See another member helping someone in need? Snitch on them and let us know! Members who enter their names will be entered for monthly prizes. Don’t want to tell us who was kind? No problem, just tell us what the kindness was. You can also post directly to our Facebook page, or FB message us. Not sure how to show your kindness? Get a group together and plan a neighbourhood clean-up. Volunteer at a charity. Shovel someone’s walk. Compliment a stranger. We have a list of 101 Acts of Kindness to get your started. Or check out this page CLICK HERE. …Passing fresh fruit to Students in the Quad to help them through the midterm crunch. …Or a Holiday Photo booth for the whole campus. We’ll also be planting a tree in the Bill Johnstone Memorial Park commemorating YOU and the amazing things that CUPE 3433 members have done for the community. Once we hit our target of 3, 433 Acts of Kindness, we’ll Celebrate! So, go out there and be KIND! 3,433 Acts of Kindness going strong! 3,433 Acts of Kindness off to a GREAT start!